Last year, I discovered the music of Mollie O‘Brien and Rich Moore, and their wonderful album 900 Baseline. It was just the two of them on stage, just voice and guitar, and it revealed the work of two very talented and well matched musicians. But what would happen if they went into a studio with fairly large group of other musicians at their disposal? Saints & Sinners is their new album, and it answers that question with glorious results. 900 Baseline revealed a duo with a wonderful feel for the blues, and that is still here. There was also some wonderful folk singing and playing, and that is back as well. But, with a broader sonic pallet at their disposal, and the input of co producers and fellow arrangers Ben Winship and Eric Thorin, the stylistic range opens up. Here are hints of Dixieland and jug band, cabaret and what I would call folkabilly. It could have been a chaotic mess, but O’Brien and Moore and their friends make it all make sense. I was sold on O’Brien’s singing last time, but here she has a harder task. Of course, a bluesy number like her own New Boots is going to work just fine, and the Dixieland/ jug band approach to Keep It Clean and Everything I’ve Got suit this style as well. Likewise, the more tender folk approach suits Lonely For a While and the title track beautifully. But here also are covers of Richard Thompson, (The Ghost of You Walks), and Tom Waits, (Dead and Lovely). These require another approach entirely. The arrangements lean towards cabaret, but the voice of each songwriter is brilliantly preserved as well. O’Brien needs a little smoke in her voice, as well as a plaintive quality for the Thompson song, and a tone of weary resignation for the Waits. She is more than up to the task. The other part of this duo is Rich Moore. He is the featured guitar player. Moore is not a flashy player, and he never upstages his singer. Sometimes his parts all but vanish in the arrangements. But his contributions are vital. Like O’Brien, Moore must be a stylistic chameleon here, and he too is more than up to the task. Moore also has a hand in most of the arrangements here, and those are brilliant throughout. A bowed bass turns up in a couple of places, and Think About Your Troubles has a wonderful oboe part. Again, none of this is for show, and it all serves the song. It also makes Saints & Sinners, the album, a rich and fascinating listening experience. I was particularly impressed with Don’t Bother Me. George Harrison wrote the song as a mid-tempo rocker for the Beatles, but here it becomes a ballad, and the lyric reveals a depth that was missing from the original. This also depends on O’Brien’s performance to bring it out, and she succeeds beautifully. At the end of the album, Rich Moore finally gets the spotlight on an instrumental he wrote called Cuba. His playing evokes tenderness and beauty, and for a moment, no words are needed. 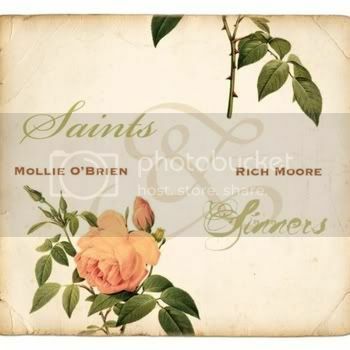 So Saints & Sinners is a collection of 11 covers and two originals. There is a fine balance to achieve in covering the works of others. The artists must make the songs their own, or choose to honor the work of the original songwriters. But here is what almost never happens: O’Brien and Moore manage to do both at the same time. Yay, local kids make good! I've been seeing Mollie and Rich play for years here in Denver. When Tim moved to Nashville, Mollie stayed put. Although when he comes to town, they do reunite, with Rich added to the mix as well. As a matter of fact, Tim O'Brien contributes fiddle parts on the album on some songs.